'Mass Mobs' Aim To Keep Pews Full At Old Churches Every month, a group in Detroit picks a church that could use an influx of parishioners to fill its pews — and collection baskets. Word spreads on Facebook, and come Sunday, the church is buzzing. A "Mass mob" fills St. Florian Church in Hamtramck, Mich. 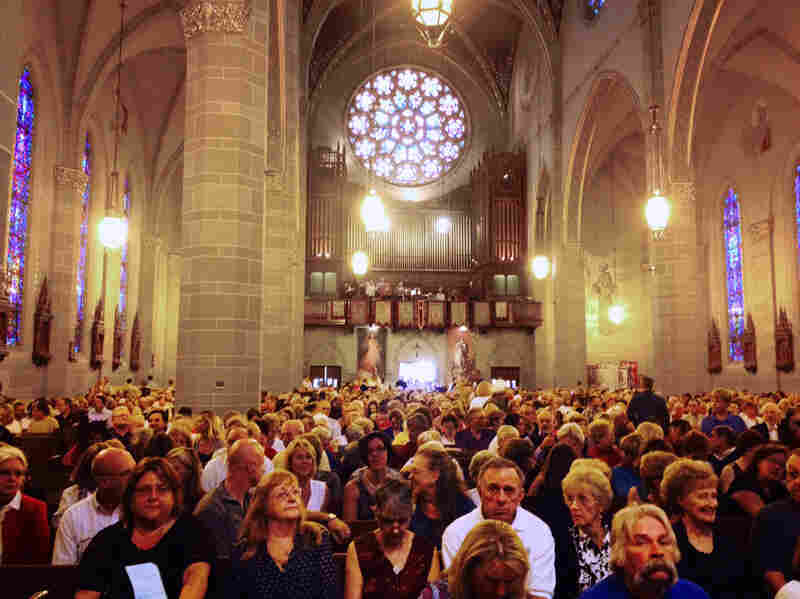 The church can seat 1,500 people, but normally only about 200 people attend noon Mass. In Detroit, a group of Catholics borrowed the idea of flash mobs for "Mass mobs" to help revitalize urban churches. Every month, a group called Detroit Mass Mobs picks a church, spreads the word on Facebook — and just like that, it fills up and buzzes with the energy it once had. St. Florian Church in Hamtramck is an eight-story, red-brick church built in 1908 by the Polish families who flocked here to work for Dodge, Ford and Packard. It seats 1,500 people, but normally only about 200 people attend noon Mass. On a recent Sunday, Thom Mann, an organizer with Detroit Mass Mob who's not a regular at St. Florian, had to get here early because, he says, "there'll be standing room only." "People are upset that the churches are closing, but the simple reason is, people don't go," Mann says. "When you have a church that seats 1,500 people, and there's 100 people there or less, how are they going to keep them open?" Detroit Mass Mob started earlier this year after Mann saw an article about a similar effort in Buffalo. The first event in Detroit was in April and drew 150 people. The Detroit Free Press ran an article right before the second event. "And it doubled our attendance. We filled that church at 400," Mann says. Nine hundred people came to the third Mass. Then they started looking for bigger churches. At the recent Mass mob at St. Florian, 2,000 people showed up. "I've always wanted to see the insides of a lot of these places," says Thom Kinney. It's his fifth Mass mob event. Kinney says there's something special about coming to Mass with so many other people. "To be in attendance when it's full, as opposed to just the sparse. There's an electricity that's amazing," he says. When you have a church that seats 1,500 people, and there's 100 people there or less, how are they going to keep them open? People trickle in, looking for seats, and then the traditional Roman Catholic Mass begins. There are Polish hymns. The priest, the Rev. Mirek Frankowski — who also doubles as music director — says the crowd nearly brought him to tears. "Because, I mean, such a big crowd, it's impossible to see these days in any of the churches. But thanks to the mob Mass we have this feeling of what it was so many years ago, when the churches were filled with people," he says. Nancy Tash is a regular parishioner here. She says she loves what the Mass mob is doing — and she hopes it gets Catholics to start going to church again. "And if they don't go to church, I sure hope they send some money sometimes, just to keep these old parishes surviving," Tash says. The day of the Mass mob, St. Florian's collection basket brought in more than $19,000 — about 10 times the amount donated at a typical Mass. The Mass mob's next target is St. Francis d'Assisi in southwest Detroit, another church that could use an influx of parishioners to fill its pews and collection baskets. A previous caption incorrectly placed St. Florian Church in Detroit. It's actually in Hamtramck, a separate city that is nearly surrounded by Detroit.